The Missionary’s Curse tells the story of a Chinese village that has been Catholic since the seventeenth century, drawing direct connections between its history, the globalizing church, and the nation. Harrison recounts the popular folk tales of merchants and peasants who once adopted Catholic rituals and teachings for their own purposes, only to find themselves in conflict with the orthodoxy of Franciscan missionaries arriving from Italy. The village’s long religious history, combined with the similarities between Chinese folk religion and Italian Catholicism, forces us to rethink the extreme violence committed in the area during the Boxer Uprising. 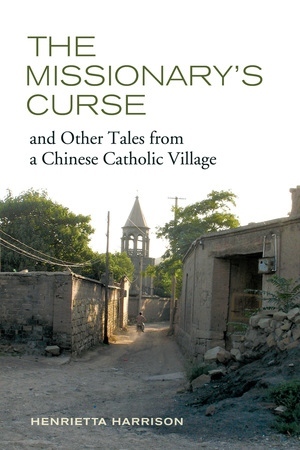 The author also follows nineteenth century Chinese priests who campaigned against missionary control, up through the founding of the official church by the Communist Party in the 1950s. Harrison’s in-depth study provides a rare insight into villager experiences during the Socialist Education Movement and Cultural Revolution, as well as the growth of Christianity in China in recent years. She makes the compelling argument that Catholic practice in the village, rather than adopting Chinese forms in a gradual process of acculturation, has in fact become increasingly similar to those of Catholics in other parts of the world. Henrietta Harrison is professor of modern Chinese studies at Oxford University. Among her books are The Man Awakened from Dreams: One Man’s Life in a North China Village, 1857-1942 and The Making of the Republican Citizen: Ceremonies and Symbols in China.